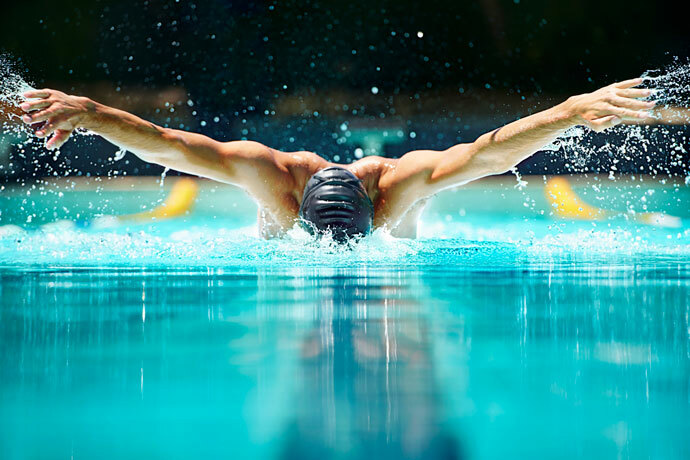 The butterfly stroke has a special place among the competitive swimming strokes. It has a reputation for being hard to learn. It is quickly exhausting. 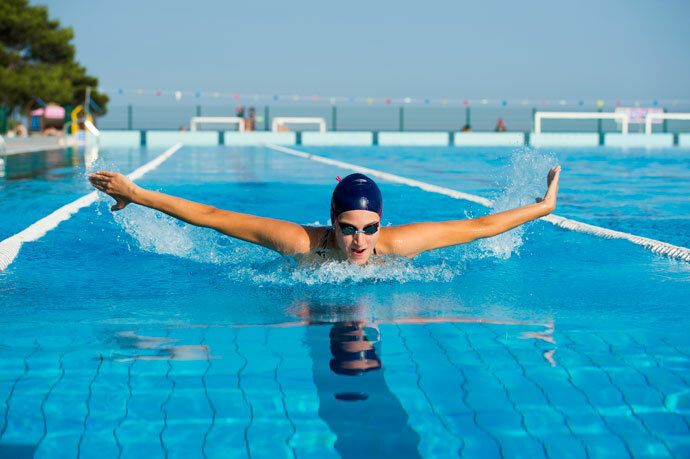 Yet when you have mastered this stroke, swimming a few lengths of butterfly can be a lot of fun because of its unusual and spectacular movements. 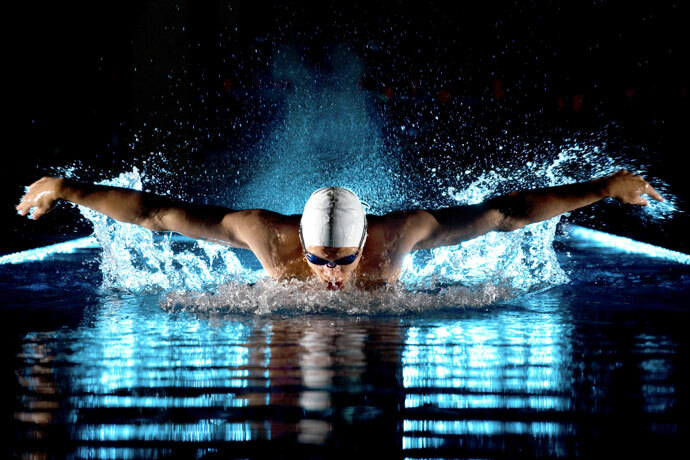 Butterfly is a spectacular swim stroke! This video shows slow-motion above water and underwater footage of the butterfly swim stroke. 1) He floats horizontally on his chest. 2) The head is in line with the torso, the face is turned downwards. 3) The arms are extended forward and shoulder width apart. The palms are facing downwards. 4) The legs are extended and together, the knees are slightly bent. 5) The feet are pointed. 1) The chest is pressed downwards, then released. 2) The arms move a little bit outwards, then bend at the elbows and the forearms and palms are brought into a backward facing position. 3) The chest starts to rise. 4) The hands move backward and inwards towards the chest. 5) Simultaneously, the hips drive down and the knees bend. 6) The hands arrive below the chest and change directions to move towards the hips. 7) As the hands move from below the chest towards the hips, a first dolphin kick occurs. 8) Shortly after the chest and shoulders are at their highest point and clear the water. 9) The hands exit the water close to the hips with the palms facing inwards and the recovery of the arms start. 10) The arms hover above the water surface and return to their initial position. Simultaneously the palms rotate so that at the end of the recovery they are turned downwards again. 11) When the arms are fully extended forward and shoulder width apart, they enter the water. 12) A second dolphin kick occurs. 13) The next stroke cycle begins. 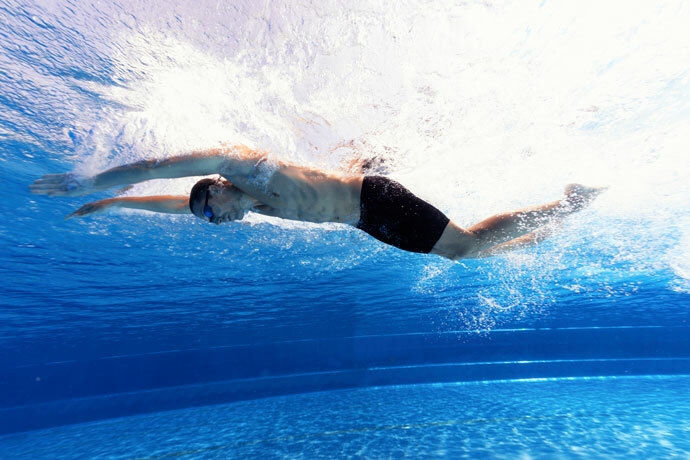 Body Movements: The wave-like body movements are at the heart of the butterfly stroke. This article explains how to generate this body undulation. Arm Stroke: This article discusses the different phases of the arm stroke and how to properly execute each phase. The Dolphin Kick: Explains and demonstrates the dolphin kick. Covers technique, number of kicks per stroke cycle, propulsive phases plus some additional tips. Breathing Technique: Explains when and how to breathe while swimming butterfly. Also covers breathing to the side and breathing frequency. Learn How To Swim Butterfly: This article gives an overview of our swimming lessons to learn the butterfly stroke. 1) At first, you learn the body undulation and dolphin kick which are the foundations of the stroke. 2) The next step is to practice the underwater arm sweep. 3) Afterward, you learn the recovery of the arms above the water. 4) Finally, you combine all the movements practiced in the previous swimming drills until you actually swim butterfly.